Adele Prince Trainer at GoodGym Lewisham and Bromley. All-round running/cycling/swimming bundle of energy. Lover of Hilly Fields parkrun. Every week, GoodGym's trainer at Lewisham and Bromley, Adele Prince, takes part in a parenting relay. 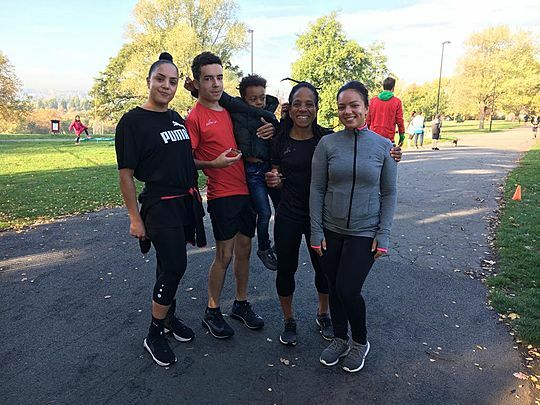 Adele spoke to two other GoodGym runners about their experience of fitting running into a family life. On a Monday and Tuesday evening I take part in a very finely tuned parenting relay, so I can jump on my bike and head over to lead GoodGym Lewisham and GoodGym Bromley. So, when someone emails me and says, 'I'm not sure how I can fit running in with family life', I know exactly what they mean. My son is now eleven (and taller than I am!) but, when he was first born, I didn't really feel a huge urge to get out running, I was pretty wiped out by lack of sleep and my life being turned upside-down. I had stopped running during pregnancy, but I did swim most days, even into 'extra time', which felt amazing. When my son was about eight months old, we got hold of a running buggy on Freecycle and everything changed. Before long we could be seen skipping along the canal, pausing to study diggers and dumper trucks in close detail, then skidding up to playgroups and library sing-alongs, our cheeks ruddy and our hair windswept. This became a sanity-saver for me, a chance to get some fresh air, reacquaint myself with my body and, I realised, made me a generally nicer person to be around! 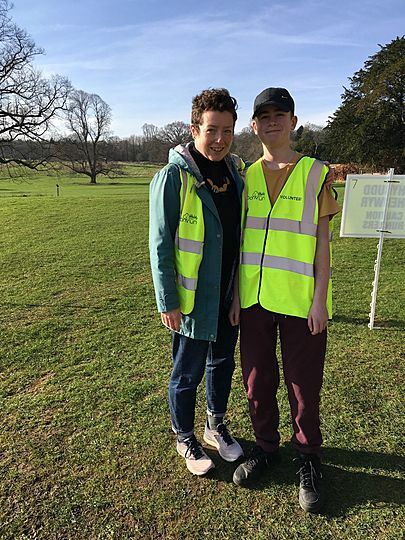 Fast-forward to now and my big(ger) boy is a regular volunteer at our local parkrun and junior parkrun - having gained his special volunteer's t-shirt - and often runs the 2k junior event on a Sunday morning. We can now run alongside each other and he benefits from everything that comes with being part of a wider community, aside from the fitness aspect of joining in, I hope that he understands the importance of making a difference through volunteering and encouraging others to achieve their goals. There have been times when I have spoken to prospective GoodGym participants who have looked at photos of our runs and wondered where they might fit in, someone once commenting, 'They're all just young, fit people!'. Yes, we do have lots of 'young, fit people' on our runs, alongside those returning to running from injury, picking running back up after becoming a parent, or juggling their time around work and family life. Everyone is welcome! I spoke to a couple of our members, one at the early stages of her parenting journey and another who now runs alongside her children and grandson. 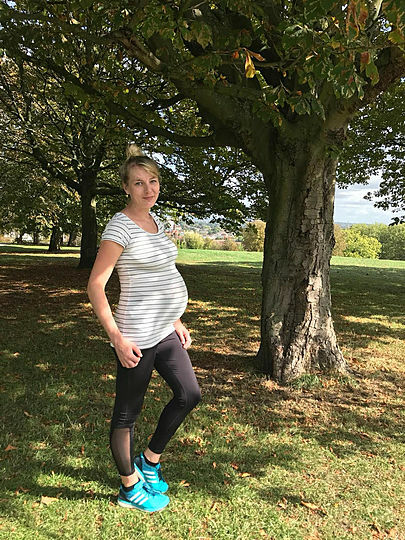 'I loved staying active during pregnancy. I ran with Goodgym until about 18 weeks and felt safe running in a group and with other mums. I hung out with the back-marker for a few weeks when I felt tired. I told Adele quite early and it was great to have her support and advice. Nurses and midwives always just tell you to put your feet up for 9 months, which is fine, but makes you feel strange to want to exercise. Once I started to feel the baby bobbing about it felt a bit weird to run, so I started swimming and did a lot of yoga, which really helped my back as the bump started to grow. 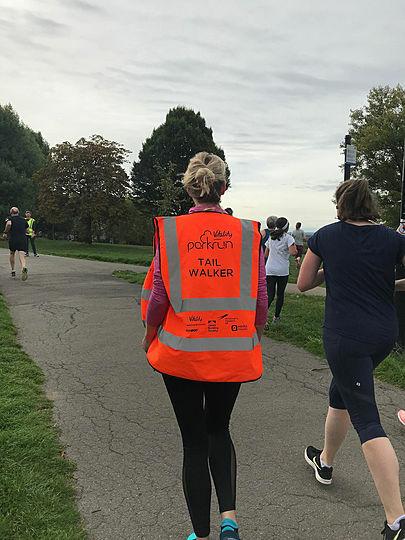 Volunteering at parkrun as tail walker was fun and helped me stay part of the community when I couldn’t run, I think the last tail walk was a week or so before my due date. When I was two days overdue I went on a big old walk (stopping for lunch and ice cream) and did about 13k - it did the trick and my contractions started the next day! 'I began being part of Lewisham GoodGym when it first started back in January 2016. Since then I've helped our local community on many occasions and made lots of great friends. GoodGym has also helped develop my running. In the past three years I've raced internationally, taken part in a 24-hour relay and run through London in the middle of the night! My weekly coach runs, where I run to visit an isolated older person, have also helped me keep to a regular running schedule. I think what comes across from all of these stories is how creative we can be in making activity fit in with a busy family life. We have lots of parents, grandparents and carers in our GoodGym family and it's great to see people fitting in a run with a child racing alongside on their bike, entrusting a small baby to a friend while they take on a much-needed parkrun, or one of our runners, who side-steps up and down the edge of a pitch while his daughter plays football (but that's another story entirely, any dads want to share their experience?). You might not be able to make it to every group run, but you will know that when you do, you will feel supported in getting out there and making every step count.